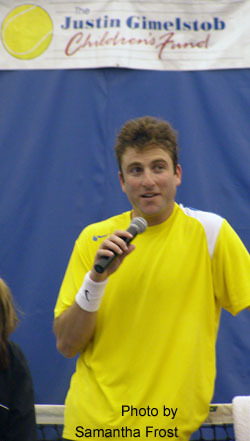 Neither snow, nor sleet, nor rain would stop Justin Gimelstob from raising money for the Valerie Fund on December 13th. When Murphy Jensen could not get in because of the weather, he simply called pal Andy Roddick (who happened to be vacationing in NY) to fill in. It was quite an event at Center Court Tennis Club in Chatham, New Jersey as Luke Jensen and John & Patrick McEnroe joined Justin and Andy for an evening of tennis, fun and fundraising. The Pro-Am started with a VIP Reception (during which Davis Cup Captain Patrick McEnroe mingled with guests) for those paying for the top tier tickets. Miss New Jersey Erin Abrahamson sang the National Anthem before a fun-filled doubles match with Andy Roddick & Patrick McEnroe vs. Justin Gimelstob & Luke Jensen. 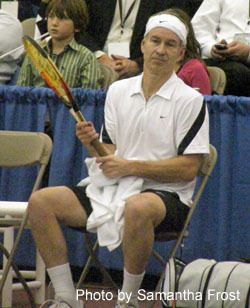 It was followed by a singles exhibition between Justin and John McEnroe. 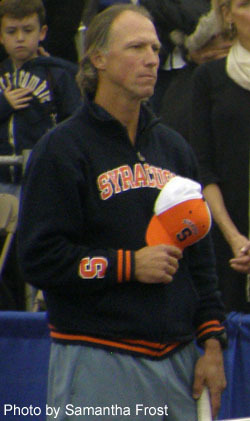 In both matches, a McEnroe prevailed. Before, during and after the matches there were raffles and both silent and live auctions, with the pros helping to get the best dollars for their offerings. Andy Roddick kept the crowd on their toes bidding on both his signed racquet (for $2250) and a pass to be his guest during his run at the 2008 U.S. Open which he garnered $13,000 for. There was also a similar experience with the Bryan Brothers, as well as tennis lessons with Venus Williams and Pete Sampras among the prizes. The bidding was exciting and as competitive as the matches, earning thousands of dollars for The Valerie Fund, a non-profit organization for children with cancer and blood disorders, that Justin had chosen as the primary recipient of the 2007 tennis exhibition. The Justin Gimelstob Children's Fund was started in 1998 "with the mission to provide financial support to a variety of children's charities and related causes in Northern New Jersey and the New York metropolitan area," according to its founder, who wrote a $100,000 check to the cause.